It was of course inevitable that sooner or later the Labour Party would start throwing out the moderates to clear the way for a Momentum agenda, and the censuring of Joan Ryan by her local party is a part of that process. Logically, there is nothing wrong with it. They have an agenda to put to the public. Why should they run candidates who will impede it? How much fairer to approach the public honestly, wearing their own clothes as it were, and if that means that well-respected Labour MPs who have given their life to servicing the community find themselves out of a seat, that is their problem. They are perfectly free to stand as independents or for the Liberal Democrats, or the Conservatives, or whatever. The left must be purified by the ejection of dissenters. That is how revolutionary governments work. Look, for example, at revolutionary France and the elimination of the Danton who would have wound down the Terror, at the orders of the purist Robespierre. The revolution had to go on at all costs – indeed, in the case of the French one, until its own children were sucked into the furnace, including, I am glad to say, Robespierre himself. There is something curiously religious in this triumph of idealogical purity over people, and many of those at the extreme political fringes would have been well at home in a mediaeval monastery, deriving satisfaction from the certainty of doctrine and even the opportunity to suffer in support of it. Or to make others suffer, I suppose. Did an ancestral Corbyn or Milne take the Cross against the Cathars? I do not know and I don’t suppose that they know either, but if they did, perhaps the instinct for doctrinal purity has come down with the genes. Or, then again, perhaps not. 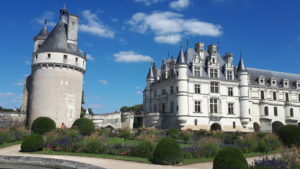 When you are next in France, I would recommend a visit to the Château of Chenonceau, one of the most beautiful houses in the world. Although it only spans a tributary (the Cher), it is close to the Loire, the centre of Royal power in the sixteenth century. That was a bloody time for Europe generally, but particularly for France, with a long succession of wars between the Catholic League and the protestant Huguenots culminating in victory for the latter, followed by their leader, Henry of Navarre, undergoing a politically-driven conversion to Catholicism in order to take the crown. By then England was already Protestant and the difference between the two faiths throws a lot of light on the different approach the two countries take to politics. Whereas France is a cartesian logical country, we in Britain are far more random and attracted to ad hoc solutions. The latter promotes a variety in approach and also a spirit of compromise. If your ideas are supported by the fact that they work rather than a magnificent edifice of intellectual architecture, you are naturally less sensitive about their being tinkered with and improved on by others. That is why our great political parties have often claimed to be broad churches. They can accommodate a number of conflicting strands of political thought, and yet continue to muddle through by drawing ideas from all of them. It is their strength, even though it leaves them looking a little bit messy. The purification of the Labour party in an attempt to achieve a left-wing consensus within its ranks, breaks with this approach. It also undermines the future of the changes it would like to make. It may win the next election, or it may not, but a continuing drive by zealots will carry the seeds of its own destruction. For a start it conflict with the national culture, which is hardly promising, but also the historical parallels, here and abroad, point up the danger of failure. Oliver Cromwell’s puritans who executed Charles 1 in 1649 lost power, and in some cases their heads, in 1660 at the restoration. The revolutionary ideas of 1789 died in the dictatorship of France by Napoleon. Better surely that the best ideas of those joining the Labour party should be melded into the fabric of British life by some of the less doctrinaire MPs with practical experience than that we should see theory run amok until destroyed by reaction? Which, after all, will do more to benefit us all and particularly the less privileged for whom Labour claims to work? That is good advice to all of us and political parties should think very carefully before undermining the plurality which enables them to heed it.